Gone are the days of reading books on paper, personal computers, etc. Now its time to read any book in a Tablet PC or e-reader. 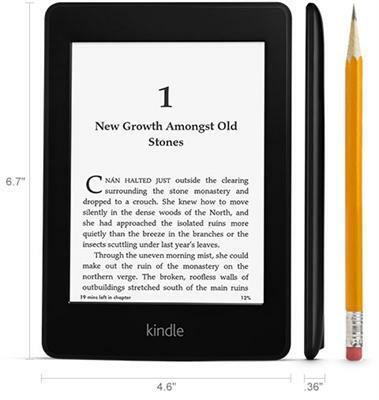 Amazon has launched a really amazing product viz., Kindle Paperwhite 3G for a wonderful e-reading experience. In this article, I shall discuss about the product, its description, advantages and disadvantages, salient features etc. Please read ahead. Kindle Paperwhite 3G e-reader : Product description and salient features. Kindle Paperwhite 3G is a e-reader launched by Amazon and it is considered the most advanced of its category in the world. It is priced at $119 in international markets. The catchy features of this e-reader are its built-in light feature, battery life of 8 weeks, touch screen with high contrast and high resolution. This e-reader has got parental control features and it supports reading children's books also. You can use the wide variety of 1.8 million titles available for e-reading experience through this e-reader. Through this gadget you can select various titles for reading with lowest pricing and wide varieties of topics are available to avail. This gadget has got a new feature viz., Time to Read which determines your reading speed and alerts you about time required to finish the content under reading. You can now download books in flashing timing may be below 60 seconds using the built-in Wi-Fi feature. Now you can also store up to 1100 books in this e-reader and make it a library on the go. You can have an assured battery life of 8 weeks even with the lights on. Now you have 8 adjustable sizes of 6 font styles with hand tuned fonts feature just exhilarate your reading experience. Kindle Paperwhite 3G delivers crisp text and pictures even in natural sunlight and of course with no glare. The contrast has been enhanced about 25% for darker and sharper text. For unsurpassed resolution while reading, you have 62% pixels more in Kindle Paperwhite. For the pleasant reading experience, you have got a patented feature viz., built-in light which illuminates the screen evenly in any type of lighting conditions. For the e-reader users, Amazon has launched the Kindle Owner's Lending Library wherein you can find over 18000 titles and you can borrow these titles without any due dates and the collection contains more than 100 New York Times best sellers both former and current titles. Display: The display has Amazon's 6 inch Paperwhite display along with patented built-in light, an optimized font technology, 212 ppi and 16 level gray scale. Size: 169 mm X 117 mm X 9.1 mm or 6.7 inches X 4.6 inches X 0.36 inches. Weight: 213 grams or 7.5 ounces. System Requirements: Actually, there is no requirement for any systems in place. It is fully wireless and not require any computer or Operating System to download content. On-Device Storage: There is an internal memory of 2 GB out of which around 1.25 GB usage is available for users. It can titles up to 1100 in memory. Cloud Storage: You can have free cloud storage only for all Amazon contents. Battery Life: On a single recharge, the battery can last up to 8 weeks provided if this gadget is used for half hour reading for a day and the wireless is off along with the light setting at 10. However, the battery life and usage may vary based on wireless usage and light usage. Charge Time: Battery's full charging needs 4 hours approximately using a USB cable in a computer. Wi-Fi Connectivity: The Wi-Fi connectivity supports most of the private or public Wi-Fi hotspots or networks even if password authenticated security wireless network and any Wi-Fi Protected Setup or WPS. Content Formats Supported: This device supports BMP, PNG, GIF, JPEG, DOCX, DOC, HTML formats through conversion, unprotected PRC, MOBI natively, PDF, TXT, Kindle [AZW], Kindle Format 8 [AZW3] etc. Warranty and Service: It comes with a 1 year limited warranty and service. For U.S. customers an optional 2 year extended warranty is sold separately. Package: The package of this e-reader is sold with the Quick Start Guide for Kindle Paperwhite, USB 2.0 charging cable and the gadget. Search option – X Ray, using this search option - X Ray in the contents with a tap, you can explore ideas, figures, topics, characters right across the contents you are reading on. This device supports various types of children's books including comics. It has got features viz., Kindle Text Pop-Up and Kindle Panel View to read and enjoy the children's books. Now, you can customize reading experience by adjusting the text size to suit your reading comfort and taste. Kindle Paperwhite comes a new feature viz., Whispersync through which you can sync your bookmarks, annotations, last page location etc. across devices and helps you to pick up where you left last. It has got the New Oxford American Dictionary for free with 2.5 million entries to immediately look up for various definitions even without moving away from the book you are currently reading. Now, its easy to search with this e-reader. Yes, you can search for any phrase or word across Web using Google search, Wikipedia, Kindle Store, Kindle Library etc. It has also got a WebKit an experimental browser for a better experience. While reading you tend to make notes in the margins likewise, in this e-reader too you can add own notes, edit, export or delete. Also you can clip the key passages or highlight them. It is easy to share any notes or quotes on social networking media like Twitter or Facebook direly without the need to leave your reading page. Assisted by the Bing Translator, now you can find the translation of any word or highlighted section in many other languages like Japanese, Spanish etc. Kindle Paperwhite 3G is much thinner and lighter than a book. You can hold this in either of your hands for long with ease and comfort. Now with the language support in Kindle Paperwhite, you can read in many languages like Chinese, Japanese, Korean etc. It also provides access to many international dictionaries. Using this gadget, you can carry on all your required documents in e-format. You can send documents to your Kindle Paperwhite using "Send to Kindle" option available online. Also your entire books in this instrument is protected as a cloud back up is provided by Amazon for all the books currently available. You can also shop wirelessly using the Kindle Paperwhite. You can also customize the looks of your gadget by using many covers available for sale. Once you open the cover of the gadget, it wakes up and while closing it also closes. You can also use the application viz., Whispercast by Amazon which is a free online tool to help your business or school for deploying of Kindle devices and also you can distribute content wirelessly. This application also helps you to send documents or ebooks to your customers, employees or students. If you already have high speed Internet connection at home, you can buy the Kindle Paperwhite otherwise it is better to go for Kindle Paperwhite 3G. The experiences of Amazon in the Kindle format have reached a pinnacle so as to say after going through all the features of Kindle Paperwhite 3G. We can expect more to come from Amazon from the Kindle series. Kindle Paperwhite is a sure bet for your money, if you are an avid reader. I personally love reading ebooks. As of now I am using my smartphone to download ebooks which are available free of cost and read them. Kindle Paperwhite 3G is an excellent device and I will definitely give it a try in coming days.